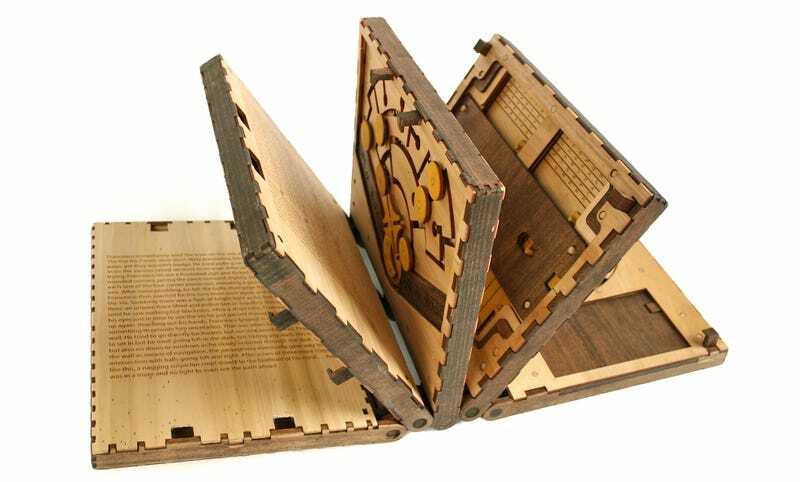 Made entirely of laser-cut wood, the Codex Silenda is half book and half mind-boggling challenge. Within its pages is a short story about an apprentice in Leonardo Da Vinci’s workshop who stumbles across a similar tome, except the version they find is actually a trap created by the artist that you’ll need to help them solve in order to escape. But don’t worry, the only thing truly at risk is your own sanity as you work through the Codex’s five unique puzzles. The Codex Silenda isn’t just some custom creation for you to drool over, however. Whitney plans to actually mass-produce the book—in a limited run—using a Kickstarter crowdfunding campaign that’s already raised more than three times its original $30,000 funding goal. You can pre-order a copy for yourself with a pledge of $125 to this Kickstarter, but that only gets you all of the laser-cut wooden pieces sometime in late December. You’ll have to assemble the codex yourself because all of the $150 pre-assembled versions have already been spoken for. Which means if you’re buying it for the challenge of solving its puzzles, you might want to ask someone to assemble it for you so their secrets aren’t revealed to you.